President Donald Trump already celebrated Halloween by bodyshaming children and insulting their parents. Now he's blanked a kid dressed up as a Tyrannosaurus rex. Happy Halloween! 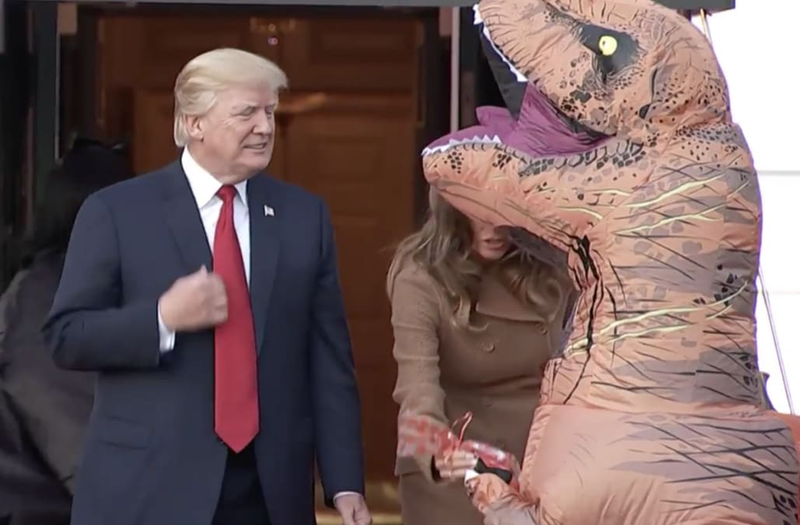 Trump awkwardly avoided a child dressed up as a T. rex while handing out candy to costumed kids before the White House's Halloween event on the South Lawn on Monday. Greeting a stream of tiny guests, the president and first lady Melania Trump were met with an inflatable prehistoric foe. Just watch the 45th president of the United States, commander-in-chief, unable to deal with a simple Tyrannosaurus. No handshake. No high five. No candy. Just two pairs of tiny hands, and not a handshake in sight. The first lady was slightly more... elated. Meanwhile, can someone get these cobwebs cleaned up? What a dump.